EI Teams spark with energy and results! 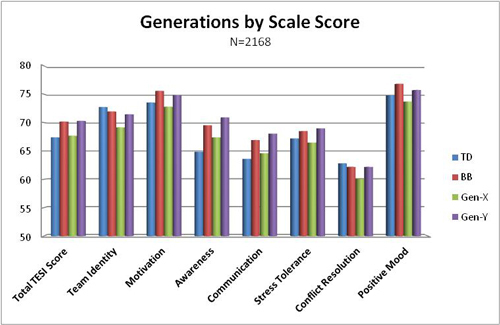 The path to these positive results is established by developing the 7 core competencies of team success: team identity, motivation, team emotional awareness, communication, stress tolerance, conflict resolution, and positive mood. Perfection isn’t required. Awareness of which strengths to maximize and which weaknesses to improve is essential to reaching the desired outcome of operating with Collaborative Intelligence™ and benefiting from sustainable productivity. Your team’s emotional and social well-being will be positively contagious for your organization, your customers and your community. The TESI® is a team 360 survey designed to guide your team to success. You can build team EI through using the TESI by hiring Collaborative Growth, by becoming certified to use the TESI® yourself or by using the Short Form of the TESI® with your team. Gen X, 	Millenials, and Boomers. How will the TESI benefit my team? Teams are the source of most of the productivity, creativity and reliability in organizations. Work and play are both successful – or not – because of the quality of teams performing the mission at hand. 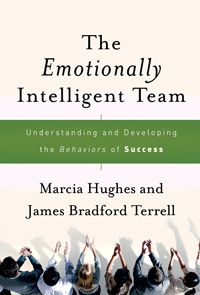 Understanding and developing the behaviors of success requires that team members develop and utilize the seven ESI skills measured by the TESI® and explained in our book, The Emotionally Intelligent Team. Powerful use of these seven skills is the path necessary for your team to experience the four results shown in the Collaborative Growth Team Model and the universally sought after benefits of sustainable productivity and emotional and social well-being for the team and its members. This journey can create profound benefits for team members, teams and their organizations. Team identity measures the level of pride each member feels for the team as a whole, and how much connection members feel to the team. Motivation is a competency that measures the team's internal resources for generating and sustaining the energy necessary to get the job done well and on time. Emotional awareness measures how well team members accept and value one another. Communication provides information on how well team members listen, encourage participation, share information and discuss sensitive matters. Stress tolerance measures how well the team understands the types of stress factors and the intensity impacting its members and the team as a whole. Conflict resolution measures how willing the team is to engage in conflict openly and constructively without needing to get even. Positive mood measures the positive attitude of the team in general as well as when it's under pressure. Understanding and responding to organizational challenges calls for state of the art communication, business and cultural savvy. Collaborative Growth provides assessment tools and methods that assist organizations in finding and employing the new strategies necessary for peak performance in today's rapidly changing environments. We guide teams to understand themselves and others, operate with all of their intelligence, and reach strategically established outcomes. Take the TESI®, which is the full version of the assessment and is available through Collaborative Growth or any of our many certified facilitators and can be taken on-line or by paper version. This is the full evaluation with numerous demographic breakouts. All seven scales are evaluated in depth. This provides three suggestions for development for each scales geared to the levels of team performance by scale. See a sample report. Take the TESI® Short, which is distributed by Pfeiffer, a division of Wiley and Sons. This short version has 3 questions for each of the seven scales. It’s an excellent way to quickly bring this information to a team or a group of leaders or individuals. It’s great to use at a conference when you don’t know who will be attending, for example. Teams that take the TESI® Short often decide to take the TESI® after their initial work to build on their team development. Learn more about TESI® Short supporting materials. To support your use of the TESI, you can purchase the Facilitator’s Guide which guides you through a full day or half day team presentation and includes a power point, agendas and much more. You can also purchase a Participant Workbook for every team member or leader who is learning how to work with his or her team, a poster to focus the training and more. 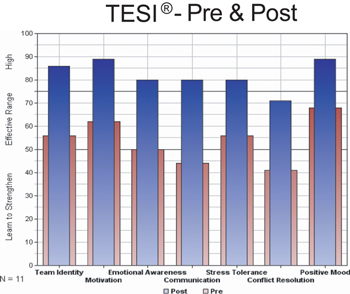 TESI®and the EQ 360® or similar other tools for individual EI development and with MBTI or Emergenetics for information on personality preferences. Individuals and teams are both more successful when they combine different yet related data.